What is a Social Security Vocational Expert? Official Transcript: What is a Social Security Vocation Expert? Hi, I am Sharon Christie your nurse attorney for Social Security Disability Benefits. 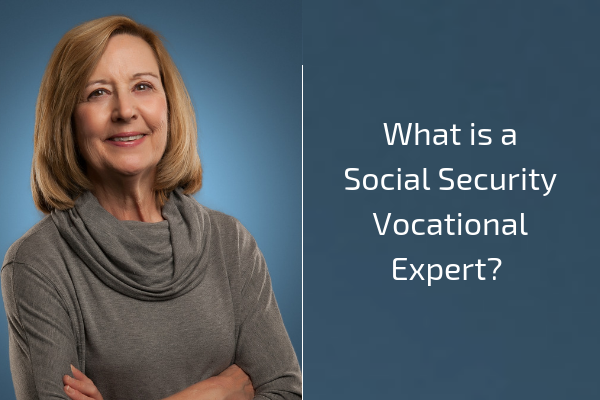 Let’s talk about what a Social Security Vocational Expert is and the role that they will play in your case for Social Security Disability Benefits. Now a vocational expert is not going to be involved in your case unless your case is going to a hearing. At the hearing, you will testify and talk about the problems that you have and why you are not able to work. There will also be a vocational expert either in person or on the phone and we are seeing the vocational experts more and more by phone than face to face. But where they are located is not nearly as important as what they have to say. The vocational expert’s role is to do two things: The first thing they are asked to do is classify your work for the past 15 years. And by that I mean the vocational expert will tell the judge what type of exertion level was involved in your past work and that can range anywhere from a desk job to very heavy exertional level. Very heavy being construction and then the vocational expert will tell the judge what skill level was required. Was it an unskilled job, a semi-skilled job, or a skilled job? Now that is the first that the vocational expert does. The second thing that he or she will do is answer hypothetical questions first, asked by the judge and then asked by your lawyer about how various limitations would affect somebody just like you in trying to do work. Now I say hypothetically because that is how the questions are asked even though we are really talking about you and your limitations. It is not phrased that way so the question will be asked at the vocational expert this way the judge will say or your lawyer will say I want you to assume you have somebody who is the same age, has the same education in the same work history as the claimant. That;s you and then the judge will ask usually a series of questions about different limitations and how they would affect somebody like you trying to work. What the goal is is to have the vocational expert agree that the limitations that are most applicable to you are the ones that would result in you not being able to work. Typically there are questions that could be several questions that result in the vocational experts saying oh yes there are some jobs that can be done and then he or she will give examples of jobs in the national economy. That is all they are required to do. Say what jobs could be done, give a specific number from what is called the dictionary of Occupational Titles, and then say how many of those jobs exist in the national economy. So I said the goal is to have the vocational expert agree that with the limitations that apply to you there would be no work that can be done. This is why you certainly need an experienced qualified disability lawyer on your side when you go to a hearing.